Mayor Boris promised to rid us of the bendy buses and replace them with the old Routemasters. Londoners loved the Routemasters for a number of reasons. Not the least of which was the open back that allowed you to dodge paying the fare by leaping off the back and into the path of the following traffic, thus escaping the conductor. A health and safety issue -of course. Really dangerous? Probably still not for the faint hearted or wobbly on their feet even though most days you travel around inner London at about 2 miles an hour. 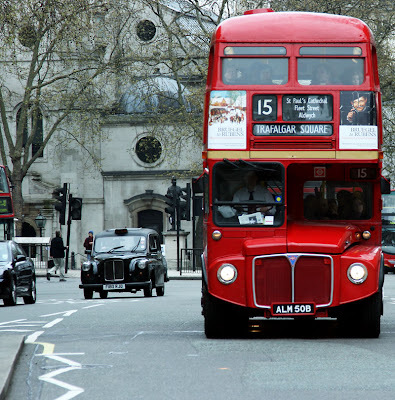 The last Routemaster ran in 2005. However, if you long for a bit of how things were there are two heritage routes you can take, and you can also hire them for your own private party. Route 9 Royal Albert Hall — Hyde Park Corner — Piccadilly Circus — Trafalgar Square — Strand — Aldwych. Route 15 Trafalgar Square — Strand — Aldwych — Fleet Street — Cannon Street — Monument — Tower Hill. They phased out the Routemaster? Why? This has been an icon of London, something we dream to ride on a future visit. I hope Mayor Boris completes his promise. that looks so cool. I have never really had to use buses or anything and the few I have were just the dirty old dial a rides. Nothing as neat as that big red bus! The epitome of what we yanks consider iconic London. Someday. Someday. Someday I really hope to see it all myself. Until then, thanks for sharing it with me. I love that bus,i love that bus,i love that bus!!!! I went there and i went away and when i came back no more like that.There were so cool,i would jump in them while running.That belongs to the charm of that town! London really need the double deckers. 2 miles an hour sounds about right! Odd coincidence, I photographed a Routemaster this afternoon here in Yorkshire. I used to live in London in the 70's and really liked these buses. The best thing about the Routemaster was travelling in traffic you could hop off and walk when the bus stopped and then hop on a different bus and continue your journey (with a daily pass of course, no fare dodging!). They could be a bit dangerous though... my Mum once fell off the back of one (trying to board as it left!). Love this photo and these are proper buses! Do you still have the bendy buses? Granted, the speed might not be overwhelming but I get seasick just looking at that second floor. Poor old bendy buses. I quite like them. We have a (very) old route master still doing the rounds here in Hobart. We moved to Brighton in 2003 and when we lived in London my route was the 38 from Hackney through to town. Actually I had no idea the route masters had all stopped running. I loved them and love your photo too. My home town has one transformed as a bar. But toilets are on the rear side (pun intended) so no dodging bar bills. As of the cab, the first time I rode one I was amazed at its inner space! You can actually have a party there. Such an iconic London scene. Londoners don't like the bendy bus?? We have them here - I think they're funny! But, not nearly as cool as a double decker bus! When I was there, they had a conductor on the back step so that you couldn't skip out without paying. It made it a bit crowded, but made sense. I loved it. Thank you Peter for leading me to London from Paris. We had those in Chennai about 50 years ago, Tiger Leyland, i still remember riding in those, But they were too large for the narrow roads and growing traffic. you can still see them in Bombay now. The roadmaster was great and iconic. It was a unique bus design for a unique town. On the other hand it was very dangerous as many people, including myself, were trying many times to board it while it was moving. I still think they should bring it back.